Toro y Moi is the moniker of 24-year-old Columbia, Chazwick Bundick, backed by a full band on tour. Toro Y Moi is constantly evolving. While heavily influenced by his parent’s vinyl and tape collection, the sound stays true to his contemporary influences of Animal Collective, Sonic Youth, J Dilla & Stones Throw hip hop, and Daft Punk, and cumulatively leading the new class of musicians deemed chillwave in genre. Last year’s “Causers of This” as well as the newer “Underneath the Pine” have drawn considerably praise and a ravenous fanbase, in Korea and abroad. South Carolina의 Columbia에서 태어나고 자란, 장난끼 가득한 얼굴의 24세 청년 Chaz Bundick (Toro Y Moi) 는 어린 시절부터 다채로운 악기들을 장난감 삼아왔다. 그의 음악 생활의 초반기는 펑크와 인디 락으로 메꿔졌으나, 2001년을 기점으로 그는 일렉트로닉과 더불어 다양한 장르의 음악들, french house, 80s R&B, hip-hop 등을 두루 섭취하며 자신만의 솔로 프로젝트에 집중하기 시작한다. 그래픽 전공 학생이었던 그가 the University of South Carolina 를 졸업하던 2009년, Chaz는 그의 음악을 완벽히 자신만의 스타일로 완성하는 데 이르렀고 많은 음악 관련 저널과 미디어들은 이러한 그의 사운드를 일컬어 ‘여름의 소리’ 라고 부르기 시작했다. Washed Out, Neon Indian 과 같은 뮤지션들과 함께 Chillwave 라는 장르를 보다 깊이있는 스펙트럼으로 끌어내고 있는 Toro Y Moi, 그의 꾸밈없는 목소리와 함께 청량한 여름의 소리를 들려줄 첫 내한 공연이 오는 6월8일과 9일, 부산과 서울에서 풀 밴드 셋으로 여러분께 선보인다. scstickets@gmail.com 로 아래의 내용을 보내주세요.입금 확인 후 예매자 리스트에 올려드립니다. # 공연 당일 선착순 입장이며 티켓은 공연장 입구에서 배부합니다. 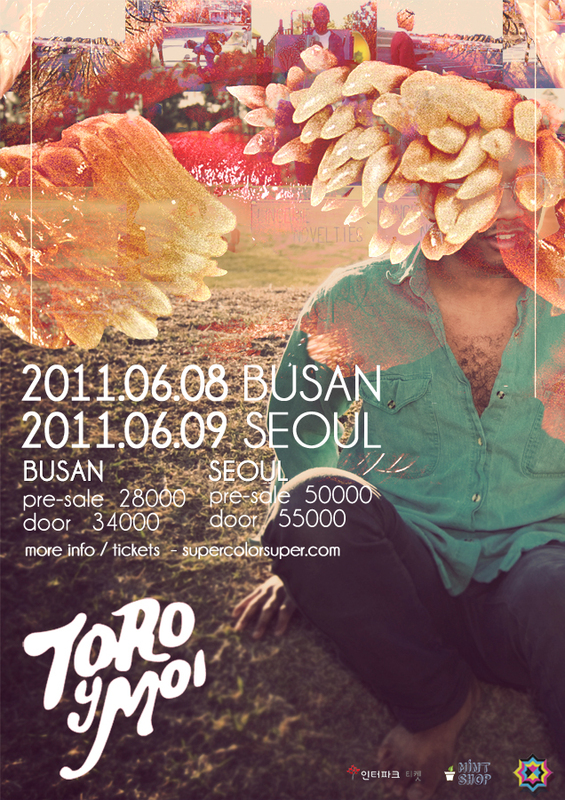 When is Toro y Moi playing in Seoul? The 8th or the 9th? I’m really excited to see these guys in Korea. A date would be helpful. Seoul – 9th June, as written above! Is there any other place to buy the tickets besides here? when i try but cant understand it. plus what are the policies for minors? He’s a great musician. Sorry I’ll have to miss this show. the doors open at 8 does the concert start at 9?